I ran to the store and picked up more white pine. This stuff is awful. I picked through all the stock to find the straightest boards – which isn’t to say these were straight. But they were straight enough, I planed them up square and cut the ogee into the top edge. I have that molding plane working pretty well now. My biggest job today was to re-grind and sharpen the blade in my #8. I nicked it yesterday and took a small chip out of it. It’s a Hock blade, and it took a lot of work to get it back in shape. It’s sharper now. I flattened the back, which was pretty far out of flat. What’s up with that? I cut the miters with my new Langdon miter box. The saw needs to be resharpened, but it’s usable. I glued the face of each, and glued the end grain at the miter too. I nailed the skirting on, including sinking a couple of brads into each miter. It’s not a thing of beauty, but it’s going to be functional. I’m looking forward to working with some nicer wood in the future. 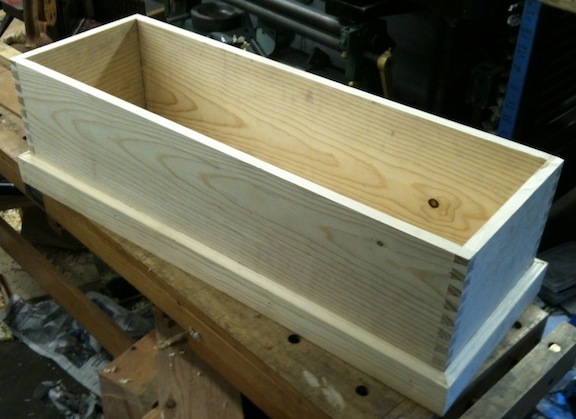 The lid is going to be a frame-and-panel piece with a skirt. I think I’ll do bridal joints on the ends of the rails and stiles, it will be good practice as I haven’t done that before. After that I just need to make some dividers to hold the saws and paint the chest. Bridle joints make it easy to bury the groove for the panel. I think I’ll do that for my lid also. Got to do some reading on how make a skirt for it as I haven’t done that before. 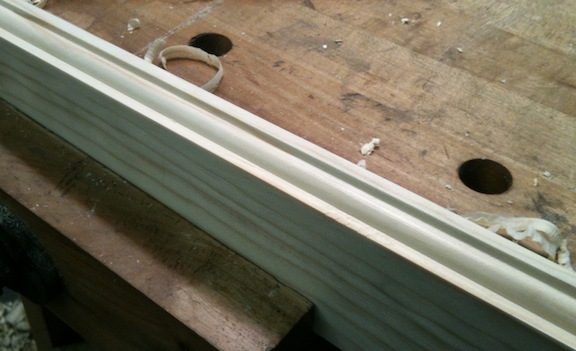 What kind of molding plane made your edge? Is it a wood one or a combo plane? No whining router can match a planed profile. The edge was done with a wooden molding plane. I think technically that profile is called an ovolo. It took 20 or 30 minutes to get the iron in shape, but then cutting the profile is *fast*, and the finish is so much better than a routed edge. I’m definitely a convert.